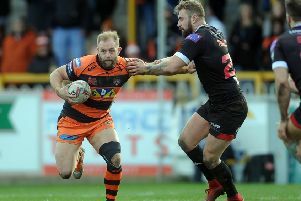 Castleford Tigers boss Daryl Powell is relishing the prospect of seeing how his team fare tomorrow night against a St Helens side he has labelled the best in Super League. Saints come to the Mend-A-Hose Jungle with a 100 per cent record after winning all six of their games so far. But the Tigers are only just behind with victories in five of their six and have a big motivation to perform better than they did against Justin Holbrook’s men last year when losing to them four times. Head coach Powell told the Express: “It’s been a good start for us and we’ve got a big challenge coming up now, but overall I am really happy with where we’re at. “If we get this right we know where we’re capable of getting to. Powell is under no illusions at the size of the task ahead. He said: “St Helens have no injuries, they’re the best team in the comp and playing consistently well. “They’ve got some players who really challenge you with their physicality. We’ve got to front up across the field really. They’ve got Makinson coming from the right side and Percival from the left. Then you’ve got Walmsley, Thompson and Roby in the middle so it’s a challenge. Cas have prop Grant Millington back after suspension, but will still be without six injured first team squad members. Powell explained: “Grant Millington’s an important player for us and he’s been missed. “One of the reasons you don’t throw punches on a rugby field really is you are going to get suspended so there was a lesson learned there.